It’s about five inches across, and may end up being a little woody. The one I took home last week, a bit smaller, was delicious, though. I prepared it very simply, first peeling off the rough exterior of the bulb, and then cutting it into bite-sized pieces (you can pop them into salted water as you cut, to stop discoloration). Boiled the pieces until tender, and then did a quick saute in olive oil and lemon juice. 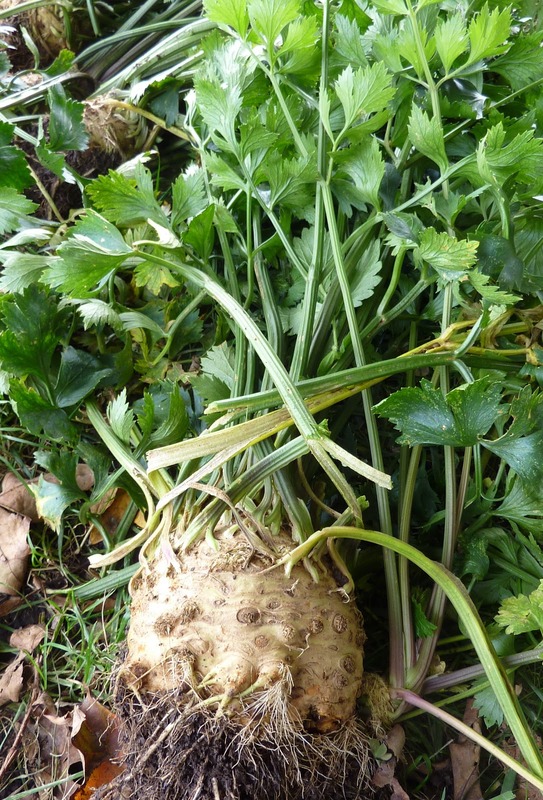 Celeriac is also good raw, particularly paired with medium-tart apples in a salad, or cooked till soft and pureed, perhaps with some butter and seasonings. Yum. The flavor is like celery but with a mellower feel, sort of like the difference between turnip greens and turnip root, but with none of the bitterness either of those can have. The plant is easy to grow, though it does take a long season to mature. I started my plants inside in early April, just to get a head start, and planted them out late in the month – and here we are harvesting in October, though September would have done. No pest problems to speak of; even the rabbits didn’t bother them. They do need to be watered, but excessive heat doesn’t seem to affect the growth or flavor. The other form of celery we grew was cutting celery (also called soup celery), grown mainly for the leaves, as an herb or flavoring. Those plants succeeded beyond our wildest dreams, and now have hollow stems thick enough to be called regular old stem celery, although they haven’t been blanched (usually, growing celery for the stems, you have to either pile up soil on the growing plants or grow them between boards to keep the stems white and tender). I find them quite edible nonetheless, good for snacking on in the garden. A professional chef, who was big on healthy food, told me this simple recipe: equal parts baking potato, celery root, and cauliflower cut into equal sized pieces, boiled, mashed, and buttered and seasoned like mashed potatoes. I've tried it and it was quite good. Thanks, Vicky – that sounds great!